The following is the Privacy Statement of Old Town Home and all services included. Please read it carefully. It's important to Old Town Home to help its users retain their privacy when they take advantage of all the Internet has to offer. What this means to you is a commitment to protecting your privacy and developing technology that gives you the most powerful, safe, online experience that you can get anywhere. Old Town Home explicitly asks when it needs information that personally identifies you ("Profile Information"). Old Town Home asks for your first and last name, location, and occupation. You may update this information at any time from within your Old Town Home account by clicking the "update user profile" option on the left navigation bar. Your public Profile Information is optional. Old Town Home keeps all of your personal Profile Information optionally private and does not share it with any third parties. Old Town Home will not disclose your Profile Information unless acting under a good faith belief that such action is necessary to: (1) conform to legal requirements or comply with legal process; (2) protect and defend the rights or property of Old Town Home; (3) enforce the Old Town Home Terms of Service; or (4) act to protect the interests of its members or others. Old Town Home will not send you any unsolicited information, including e-mail, except as mentioned below. New users will receive a Old Town Home welcome letter explaining the features provided by the service. Under exigent circumstances, Old Town Home may be required to send you information about the service or your account, but Old Town Home will not send you unsolicited e-mail regarding any commercial offers or advertisements at any time. If at any time you believe that Old Town Home has not adhered to these principles, please notify us by e-mail at [email protected] and we will use all commercially reasonable efforts to promptly determine and correct the problem. For more information about our privacy statement, see the Terms Of Service Agreement (TOS) and All Rights Reserved Document, or the Frequently Asked Questions (FAQs) below. 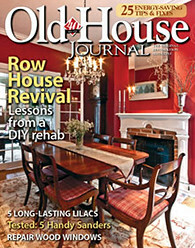 Old Town Home LLC is a participant in the Amazon Services LLC Associates Program, an affiliate advertising program designed to provide a means for sites to earn advertising fees by advertising and linking to amazon.com. Safeguarding the Profile Information of children is extremely important. Old Town Home collects the minimum amount of Profile Information necessary to operate the service. A child's Profile Information will be used for operation of the service but it will never be used for uses related to the site's service but not necessary to its operation (a "Secondary Use"). There are a number of emerging standards in the area of children's privacy that will affect how we process a child's Profile Information in the future. Does Old Town Home collect other forms of information about its users? In addition to the use of Profile Information to operate the site, Old Town Home also gathers anonymous information, which may be used by Old Town Home or shared with its advertisers. This is information which does not personally identify you, but which may be helpful for marketing purposes or for improving the services we offer. Generally, this information is collected through "traffic data" and may entail the use of "Cookies", "IP addresses" or other numeric codes used to identify a computer. How do I correct or change Profile Information that I have given to Old Town Home? You may update this information at any time from within your Old Town Home account by clicking the "update your profile" option on the navigation bar. Is my Profile Information secure from others using the Old Town Home site? Profile Information collected by Old Town Home is stored in secure operating environments that are partially available to the public. All identifiable information such as IP address and email are kept private unless the user specifies differently.